I’ve come across some goals either on other lists or just while doing something at home that I want to add to my next 101 list. Of course who knows if I’ll still want to do any of these in 2012, but I don’t want to forget them either. If you have any goal suggestions feel free to leave a comment or send me an email. I like the trying new wines one. Have you ever been to a winery? Going to one (or more?) might make a good list item too! Does your Star Wars marathon include the Clone Wars Movie plus series as well?? ;) cause thats going to take forever! Awesome! Glad I could spark another idea for your next list. Driving a manual is a little scary at first, but it’s a lot of fun once you get used to it. Whoohoo I made the list lol! I think this is a great idea, I’m always finding great ones on lists that I’m afraid I’ll forget. I love the A-Z book challenge idea! 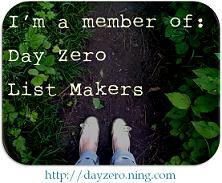 You should also check out the goal thieves on Day Zero List Makers!! i like your new ideas a lot! i found you on stacey’s page! i’m def going to come back and check your updates out. i like talking to other people doing a 101. my list is at http://www.erins101in1001.wordpress.com if you want to check it out! Thanks for checking out my blog! Have you joined http://dayzero.ning.com yet? If not, you should!